Not many in Taiwan knew who Santa was, not until the 1950s anyway. Then all of a sudden, pictures of a jolly Santa Claus appeared everywhere. In 1963, Christmas Day became a national holiday; although it was officially the Constitution Day. It was scrapped in 2001, now observed only in Protestant and Catholic schools. 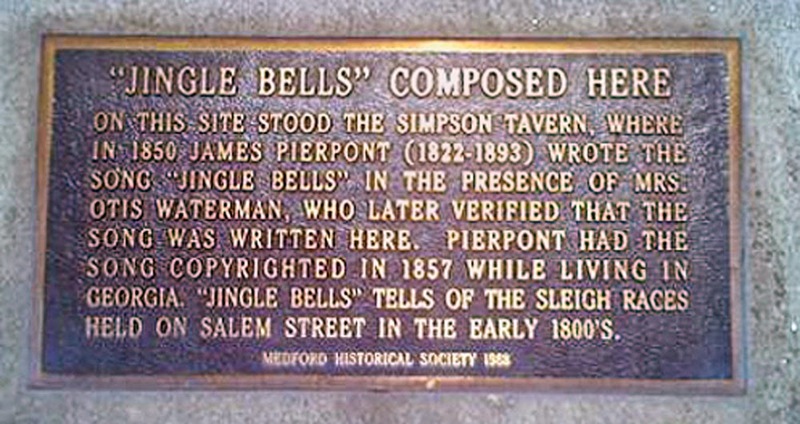 James Pierpont composed the song at Simpson Tavern and first performed it in 1850. He later moved to Savannah, Georgia, and published the song in 1857 (hence the persistent misunderstanding that the song was first written there). He passed away in Savannah, although was buried back in his hometown, Medford. Temporal and spatial connection through a song? You bet. Merry Christmas, everyone! I must have passed by 19 High Street in Medford Square a million times until boston.com pointed out the existence of that plaque. 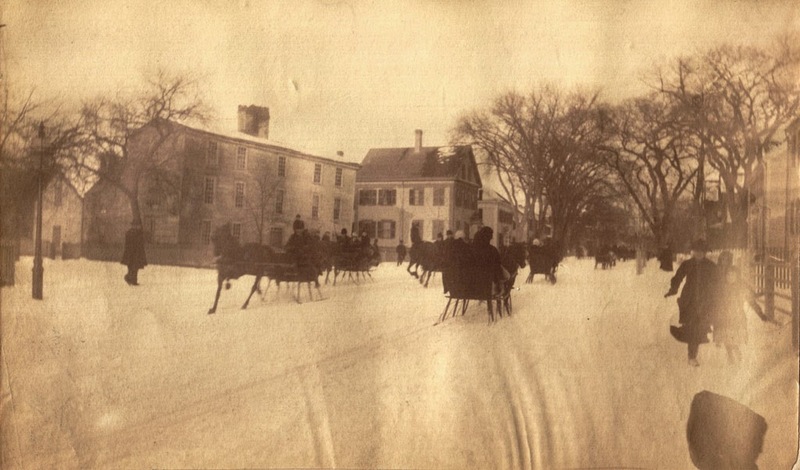 And we regularly travel on Salem Street to a Taiwanese restaurant in Malden, never know it was where sleigh races took place. There are numerous such historical gems around here, almost like Tamsui. Too bad they cancelled Christmas in Taiwan. I still remember my very first Christmas present, a water color set, received when I was in the 4th grade. HM, sorry we didn't have more time to talk on your last visit. I think there were too many interesting people at our dinner table. btw - lookup the Wayside Inn and the Beekman Arms on Amazon - you will find two good books written by my bro. 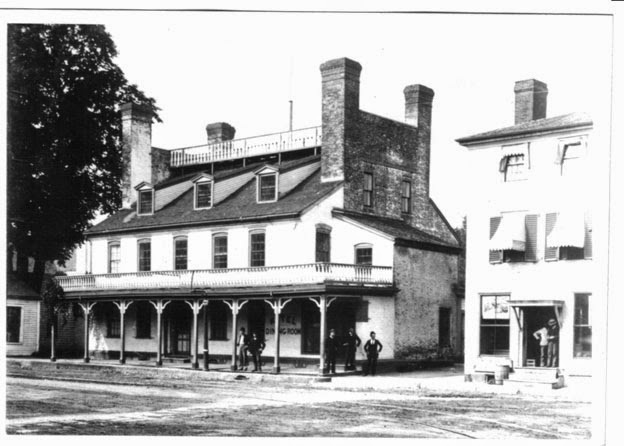 The Beekman Arms is in Rhinbeck NY, nearby where I grew up. That was my second dinner in that evening. I did enjoy listening in on the conversation, though. Glad to know poinsettias are still popular, kids were warned that they were poisonous when first appeared (in the 50s, I think). Which is not true at all. Oranges are always in season right before Lunar New Year. The original bigger version of mandarin oranges 椪柑 was decimated by a disease，probably has not recovered yet. I'll look up the books. Thanks. Come to think of it, there was an argument over how Christmas should be translated. The initial version 聖誕節 conflicted with many 聖 deities in Taiwan, it was therefore changed to 耶誕節. 耶 is short for 耶穌 Jesus, pronounced Ye-su in mandarin as in German without the s. Taiwanese pronunciation is Ya-so, seems to be in that way since the publication of the first Holy Bible in Taiwanese language. Not sure how that got started.